Electric vehicle sales are growing fast in the U.S. — up well over 70% from the year before — which is why it’s no surprise automakers are showing them off at the L.A. Auto Show, opening today to the public. Nearly 45,000 electric vehicles were sold in the U.S. in September, the best single-month of EV sales ever. There are now more than 40 electric vehicles on the market in the U.S. This year the L.A. Auto Show is featuring EVs from both other startups and from major automakers, including an improved selection of larger electric vehicles. The truck that’s already stolen the show is Rivian’s all-electric pickup truck. 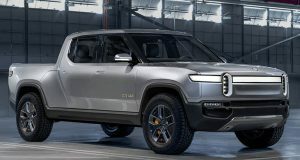 Promising to be available in 2020, Rivian’s R1T would be the first all-electric pickup on the market. Starting at $69,000 (or $61,500 after the federal tax credit) the R1T is definitely not for everyone, but its price is on par with the top-of-the-line 2019 Ford F-150 ($70,560) and the 2019 Nissan Titan XD ($63,610). The R1T promises both speed (the base model claims 0-60 mph in 4.9 seconds) and strength (an electric motor on each wheel delivers power and traction that adjusts to the road conditions, useful for snow or off-road excursions). The LA Auto Show’s focus on electric vehicles comes at momentous time in American history and the auto industry’s development. This week General Motors announced it is ending production of most of its car line (in large part due to falling behind the competition in this segment), but promises to invest the savings heavily in developing all-electric vehicles. Consumer Reports Advocacy will be looking for General Motors to keep their commitment to double investment in electric and autonomous vehicle programs in the next two years and provide the kinds of features — like improved fuel efficiency — that consumers continue to demand, especially for large vehicles. Truth is, GM is going to have to invest heavily in electric vehicle technology or risks being left behind. Major automakers have announced $255 billion on electric vehicle investments through 2023. More than 1 million EV have now been purchased in the U.S., a new milestone for a product first introduced to the mass market in 2010, and with automakers investing in EV technology, and lithium-ion battery costs dropping, the next million will come much more quickly. Electric vehicle infrastructure is also expanding. Just this week, Colorado announced it is investing over $10 million in electric vehicle fast-charging stations across the state, which will expand travel options for current and potential Coloradan EV drivers (who may further benefit from expanded EV options if it adopts ZEV standards next year). Of course, a few automakers have sprinted far ahead of others in the electric vehicle race and some electric vehicles still have a higher purchase price than their gasoline-engine counterparts, which is why Consumer Reports Advocacy, formerly known as Consumers Union, sent a letter to U.S. Senators this week asking that the $7,500 Federal EV Tax Credit be continued or reformed, so consumers can choose the vehicle that is best for them without automaker-based limits. Consumer Reports has the answers to all your EV Questions in our special Electric Cars 101 primer. And to see more of Consumer Reports coverage of the LA Auto Show, click HERE.